The 2017-18 season may have ended on a low note for the Massachusetts hockey team, but it’s tough not to see reasons for positivity heading into 2018-19. 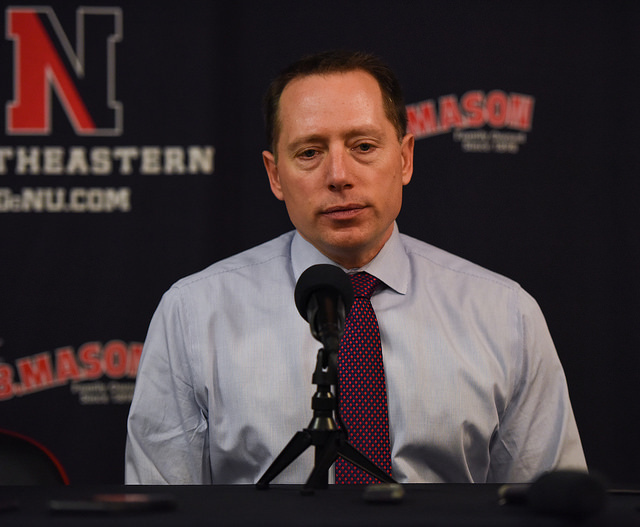 After the Minutemen were bounced from the Hockey East playoffs by Northeastern (23-8-5) on Saturday, UMass coach Greg Carvel spoke optimistically about the future despite the 7-2 humbling. Saturday’s loss marked the end of an impressive season for the Minutemen (17-20-2), who more than tripled their win total from last season, hosted their first Hockey East playoff game in 11 years and made a run to the Hockey East quarterfinals. Expectations were low for UMass, and those expectations were exceeded and then some. “We just had that difficult end of the year conversation with your team,” said Carvel, “and part of it was I think there’ll be expectations for our team next year. We were predicted to finish last in the league this year, and I don’t think that’ll be the case next year. The only sure departures for the Minutemen are seniors Jake Horton and Niko Rufo, who closed out their collegiate careers on Saturday. Aside from them, UMass will likely return its entire roster, included its highly-touted freshman class, a group of 13 first-years that claimed a bulk of the ice time this season. Eight of UMass’ top 12 scorers this season were freshmen, including each of the top five. Carvel started six freshmen on a frequent basis, putting a ton of faith in his rookies. The only Minuteman whose future appears immediately uncertain is Cale Makar, the fourth overall pick in the 2017 NHL Entry Draft who will make his decision this spring whether to stay in Amherst or move to the pros. If Makar stays, pairing him with fellow draft pick Ferraro, along with an all-freshmen top line of Jake Gaudet, Oliver Chau and Mitchell Chaffee would prove even more lethal with another year of growth for the group. While he won’t be a part of the team’s future plans, Rufo has seen the sort of growth that UMass aspires to achieve first-hand during his time at Providence, and he’s confident the results will be similar.